Home » Etymology » Say “Cheese”! As noted in my earlier post, dairy consumption is a predominantly European tradition, due to higher levels of lactase persistence (that is, ability of adults to process lactose, a form of sugar found in milk). While cheese-making processes reduce the amount of lactose found in cheeses, and hence opens dairy consumption to a broader population, cheese production and consumption are still also a predominantly European practice, as can be seen from my maps on the left. 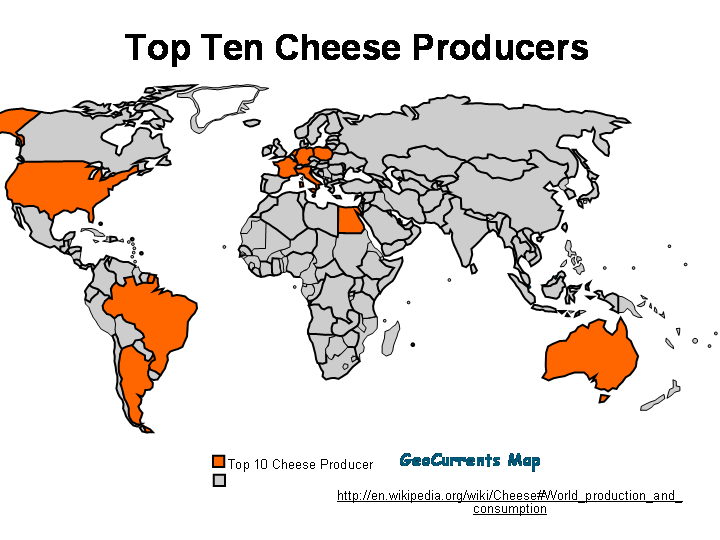 Half of the top ten cheese producing countries are found in Europe. 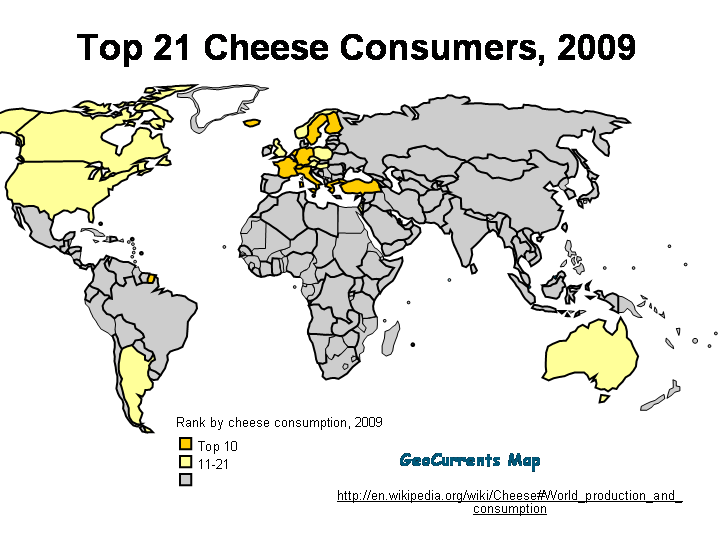 As for the quantities of cheese consumed, the only non-European countries in the top 21 positions all have a strong European heritage (United States, Canada, Australia, and Argentina). 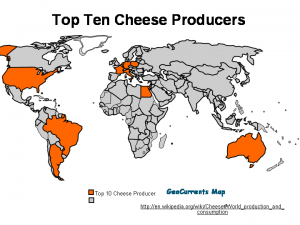 Local types of cheese—such as paneer in India or sulguni in Georgia—are widespread outside of Europe, but the amounts consumed are not as significant. 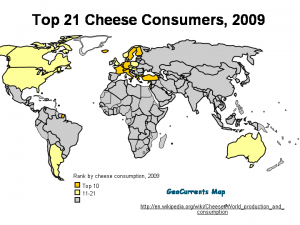 The Greeks, the French, the Icelanders, and the Germans are the top four cheese consuming nations, but how they refer to their beloved cheese differs from language to language, as can be seen from the map reproduced on the left. As with the ‘onion’ vocabulary, discussed in my earlier post, the distribution of ‘cheese’ words in European languages tells a story of both common descent and borrowing. Once again, we’ll begin with Latin and its descendants, the Romance languages. The Latin word for ‘cheese’ was caseum, from which some of the Romance languages derive their ‘cheese’ words: Spanish queso, Portuguese queijo, Sardinian càsu, and Italian cacio (the latter refers to a certain kind of cheese, not cheese in general). English cheese comes from the same Latin source, as does the learned 19th-century creation casein for ‘milk protein’. Other West Germanic languages also feature caseum-based words, borrowed at an early date from Latin: Dutch kaas, West Frisian tsiis, and German Käse. Celtic languages too have caseum-based ‘cheese’ words: Irish cáis, Scottish Gaelic càise, Welsh caws, Manx caashey, Cornish keus, and Breton keuz. Other Romance languages—French, Occitan, Catalan, and Italian (if we focus on the general ‘cheese’ term)—went a different route, featuring a word based on the Latin forma which meant ‘shape, mold’. (In French, the root underwent a process known as metathesis whereby two sounds reverse in order, giving the present-day form fromage rather than the expected “formage”.) The use of the root forma for ‘cheese’ derives from the Vulgar Latin expression caseum formaticum ‘cheese made in a mold’ (literally, ‘cheese molded’). Over time the noun was dropped leaving just the adjectival modifier behind—shedding the mold, so to speak. A similar story happened with the Romance words for ‘liver’. The Latin word for ‘liver’, both as an organ and as a food, was iecur, but modern Romance languages derive their words for ‘liver’ from a Latin root meaning ‘fig’, which they also inherited: compare the Italian fegato ‘liver’ to fico ‘fig’, the Spanish hígado to higo, and the French foie to fugue. 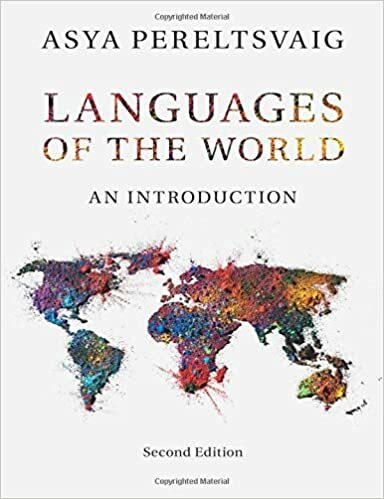 (As is typical, the French words underwent the most phonological changes, so the connection of ‘liver’ to ‘fig’ is the least obvious in this language.) Back in their day, the Romans enjoyed a delicacy of goose liver from geese fed on figs (not unlike the present day foie gras), which they called iecur ficatum, literally ‘liver figged’ (although it was the goose who was “figged”, that is overfed on figs). Over time, the noun iecur was dropped, leaving ficatum to mean ‘goose liver’; later, the term was extended to mean ‘the liver of any animal or person’. This process of dropping the noun and making the adjective fulfill its role is not limited to Vulgar Latin: consider such English deadjectival nouns as final (exam), capital (city), and adhesive (tape). As is the case with ‘onion’ words, the North Germanic languages, unlike their West Germanic counterparts, did not borrow the Latin term. 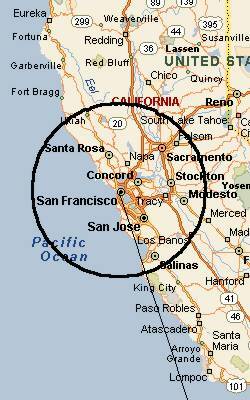 Mainland Scandinavian ost, as well as Icelandic and Faroese ostur, derive from the Proto-Germanic root *justaz. Finnic languages of northern Europe borrowed the Germanic root, hence the Saami vuostá, Finnish juusto, and Estonian juust. This pattern of borrowing is different from what happened to the ‘onion’ words, which Finnic languages borrowed from Latin, while the Germanic root was adopted by Proto-Slavic. Note also that the Hungarian word for ‘cheese’, sajt, does not show any connection to its Finnic cousins. Instead, it was borrowed from an Iranian language, demonstrating that Magyars and Iranian speakers once lived in the same area, most likely in the steppes south of the Ural Mountains. 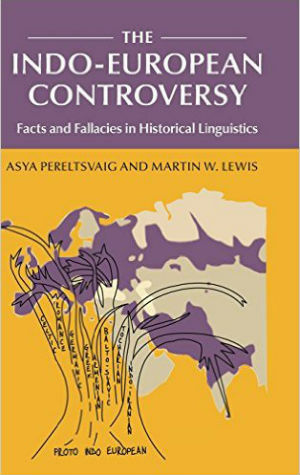 Indeed, this is only one of many borrowings between Uralic and Indo-Iranian languages, suggesting long-term contact, as discussed in my earlier post. 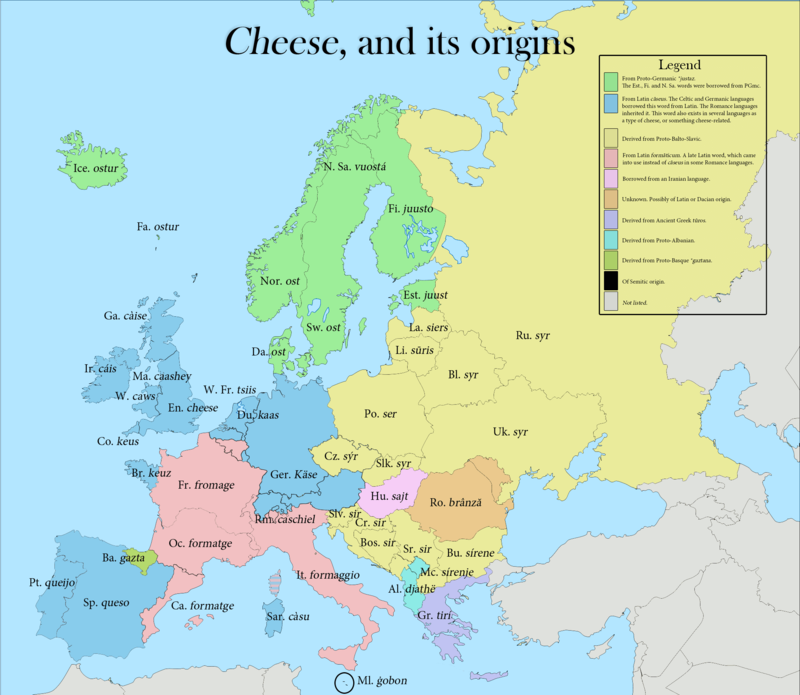 Unlike with the ‘onion’ words, where some Slavic languages feature a Germanic root and others a Latin loanword, when it comes to ‘cheese’ all Baltic and Slavic languages retain the root derived from Proto-Balto-Slavic. According to Vasmer’s Etymological Dictionary, this root is related to Lithuanian sū́ras ‘salty’ and Latvian sũrs ‘bitter’, as well as to Old Icelandic súrr ‘fermentation starter’ and sýrа ‘sour milk’, Old High German sûr ‘sour’, and Albanian hirrë ‘whey’. Note that the Albanian word for ‘cheese’, djathë, is not related. 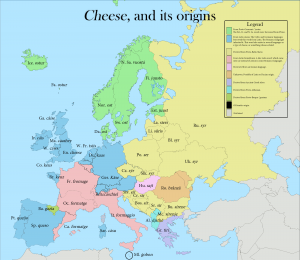 Other isolated European ‘cheese’ words include the Greek tirí from Ancient Greek tūros, of unknown origin, and the Romanian brânză, perhaps of a Latin or Dacian origin. The latter word is also used in some Slavic languages, such as Russian and Ukrainian, specifically for feta-like salty cheese, which is itself an import from the Balkans. Unlike with the ‘onion’ word, the Basques did not borrow the ‘cheese’ word from Latin but retained the Proto-Basque root *gaztana; the modern Basque word is gazta. Finally, the Maltese language, which is closely related to Arabic but has borrowed heavily from Italian, retained its Semitic roots for both ‘onion’ (basla; cf. Arabic basal, Hebrew batsal) and ‘cheese’ (ġobon; cf. Arabic žubna, Hebrew gvina); recall that in Semitic languages it is the consonants alone that constitute the root, not the vowels.